(1April2011)This issue review methods of calculating displacement. 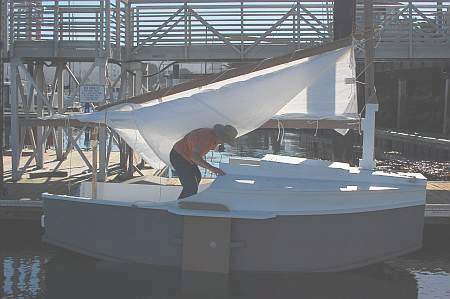 The 15 April issue will review rigging a sharpie sprit sail. We're not in Kansas anymore! 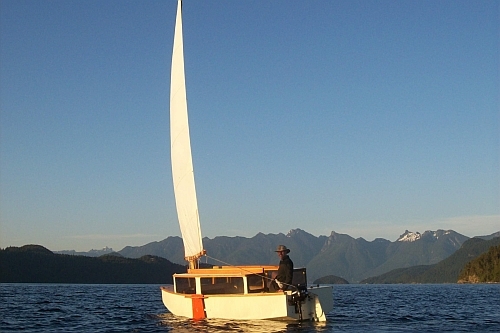 Bob Enninberg sailed his new Scram Pram out in British Columbia last summer. 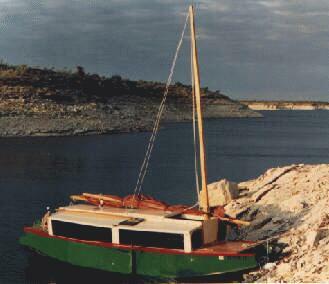 One of the real basic errors in boat design is to not match the capacity of the hull to the weight it needs to carry. It's actually pretty easily done. 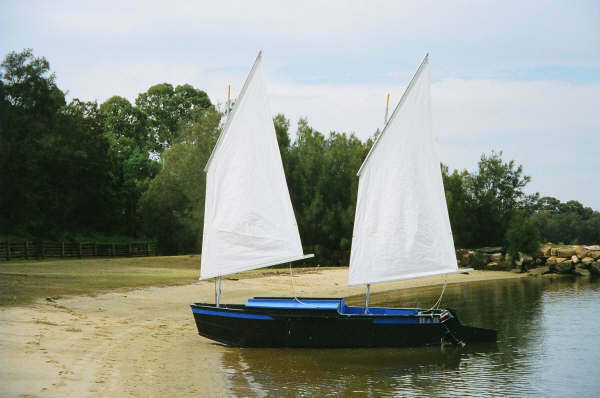 Let's take an example: a fellow wants a 12' skiff to handle two adults. He figures the empty boat will weigh 120 pounds and the adults together at 350 pounds. So he has to float a total weight of 470 pounds. One thing is for sure: no matter what the shape of the hull, it will sink into the water until it pushes aside, or displaces, 470 pounds of water. (The way I heard it was that ancient Greek mathematician Archimedes figured out the basics while sitting in the bath tub.) Fresh water weighs about 62 pounds per cubic foot and salt water usually about 65 pounds per cubic foot. So the volume of fresh water displaced by the 470 pound boat is 470/62 = 7.6 cubic feet. That was easy! Next the problem becomes one of shaping the underwater part of the hull such that it displaces 7.6 cubic feet with good flow lines. We talked about the prismatic coefficent a long time ago and you should be able to look it up in the way back issues index. Basically we construct a prism with the same length as the waterline length and the same cross section as that of the boat's maximum beam. The hull will fit neatly into the prism. Divide the volume of the underwater hull by the volume of that prism and you have the prismatic coefficient. So I figure if you were to assume a halfway normal displacement hull has a prismatic coefficient of .55 then you would always be within 10% which is actually pretty good. So without drawing a line I might say that the 470 pound weight will need a "prism" with a volume of 7.6/.55 = 13.8 cubic feet. The prism could have any combination of cross section and length that will have that 13.8 cubic feet total volume. Remember that the prism has the same length as the hull's waterline length and underwater cross section as the boat's maximum cross section. 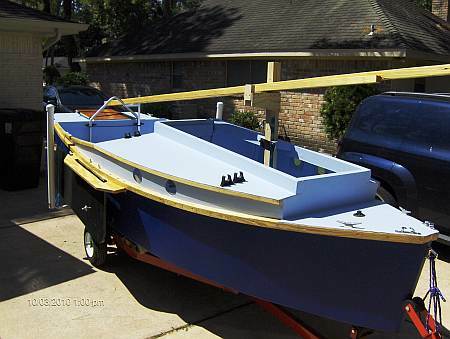 Remember we want a 12' boat, but the waterline will be shorter if we want some rake to the ends (for looks) and maybe enough rocker to make sure the stem and stern don't drag the water (for low drag). We might guess that the waterline length will really be about 10'. Then the maximum cross section would have to have 13.8/10 = 1.38 square feet of area below the waterline. 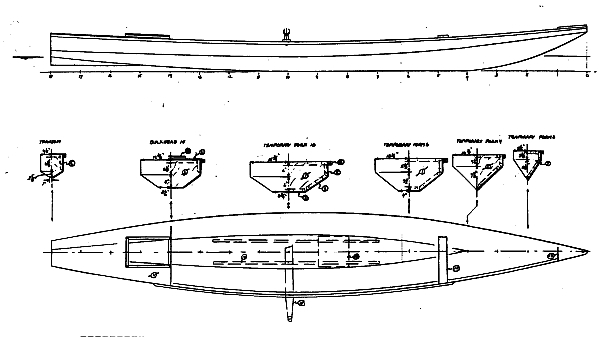 If we wanted a flat bottom 3' wide (wide enough to have sailing stability and narrow enough for reasonable rowing) we would have a draft of approximately 1.38/3 = .46' or 5.5". METHOD 2: THE CURVE OF AREAS... This method of the "curve of areas" is an accurate and flexible way of determining the volume of almost any oddly shaped thing. It's actually pretty easy to do but first you need a drawing of the proposed boat (unlike the prismatic coefficient which just needs a general idea of the boat). The area enclosed under the curve of areas is a volume and is indeed the volume of the underwater hull - it's what we are looking for. In the old days you would measure the areas with a planimeter, a clever and expensive gadget. But you can do well by just breaking down the curve into triangles and trapezoids, figuring the area in each trapezoid, and adding them all up. In the example, second trapezoid from the left is figured by 1/2(175+209)X12 = 2304. Adding the sections together gives us a total of 12500 cubic inches at 5.5" draft. That equates to 7.2 cubic feet of displaced water which is 450 pounds of fresh water. So the first guess was off by 20 pounds or about 4%. By the way, the drawing showed a waterline length of 9'5" instead of the first guess 10'. 1920 cubic inches equals 1.1 cubic feet. Wood usually weighs 25 to 35 pounds per cubic foot. At 30 pounds per cubic foot the mast would weigh 33 pounds. You can also use the area of curves to find the CG of the object, too. For real simplicity I've seen designers in the aircraft industry draw the curve on cardboard, cut it out and balance the thing on a knife edge. The item's CG will lie on that balance line. Finally you can use your computer to figure it all out. I'm sure all of you know that getting the computer to spit out the right answer might take a lot longer than doing it by hand. The program I used to get the drawings above was Hullform6s which can be downloaded from the links shown at the end of this page. 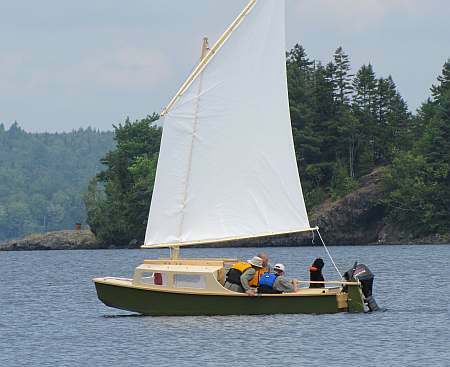 What were the answers that Hullform6s predicts for the 12' skiff with 470 pounds displacement? 5.5 " draft, waterline length of 9'4", and prismatic coefficient of .55! So the first guesses were quite good. But the area of curves method was also excellent, within 4%. It showed the same waterline as Hullforms. Perhaps with more data points to flesh out the curve the hand method would get the same answer as hullforms but I wouldn't bother. You will never guess the weight of the finished boat within 4%. This long narrow boat was designed a long time ago for Mark Bustemonte who thought it might be possible to have a boat for fast sliding seat rowing, for slower fixed seat rowing with a passenger, and maybe for use as a canoe by kids. I agreed with the idea. I had already once rigged Toto with outriggers and oars. Toto is too short to take a sliding seat. She was a bit faster under oars than with paddle - you can get lots more muscle behind oars and I think the oars are less tiring. 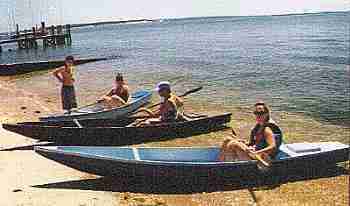 But the low slung oars were a problem in rough water and I suspect that is a problem with all low sided rowboats. Also I didn't think the extra speed made up for the extra gear involved and having to watch my own wake instead of seeing what's up ahead. For sneaking up on wildlife and such, the double paddle or kayak has it all over any type except for maybe an electric. 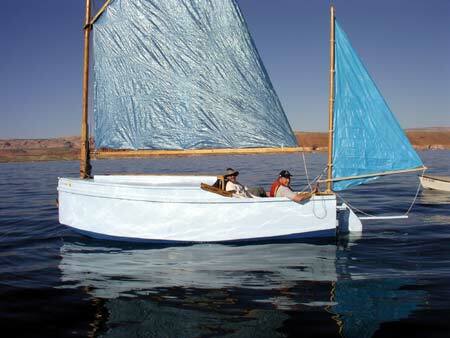 Anyway, with the extra length of Marksbark, I think she'll hit 6 mph in good conditions and cruise forever at 4 mph. It will be interesting to see if Marksbark is stable enough for normal kid rough housing used as a canoe. She's already wide for a sliding seat boat. Marksbark was drawn well before I put a simple straight plug in the middle of Toto to get a Larsboat. Today I would suggest simply putting a 5' straight plug in the middle of Toto to get the length of Marksbark, long enough for a sliding seat. Instead back then I stretched out the Toto which will probably look more elegant but the prototype builder will have to keep a close eye out to see if the pieces all fit since all this was done before I figured out how to use a PC to give the shapes of the expanded panels. 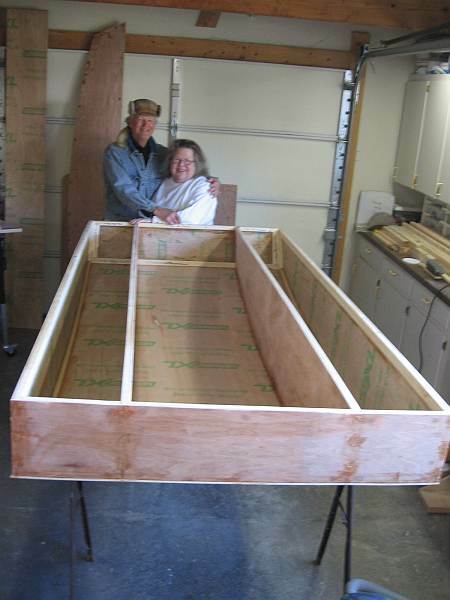 He ought to do what I did with the original Toto - stick it all together except for the bilge panels and then trace the shape of the bilge panel hole onto cardboard and transfer to plywood. The Marksbark plans do give the shape of the bilge panel but as with all multichine shapes it pays to cut that bilge panel well oversized and trial fit to see if the lines are correct. The thing is the last piece of the puzzle catches all the previous mistakes of the builder (and designer!) and a trial fit before cutting to the line is always a good idea. Marksbark plans are $20 until a prototype is built and tested. Needs four sheets of 1/4" plywood with taped seam construction. No jigs or lofting required.